The second decade of Superman's history can be characterized by three developments: the introduction of Superboy, a new explanation of the origins of Superman's powers, and a new preoccupation with the planet Krypton and its inhabitants. This period is generally considered to fall between the Golden Age Superman and the Silver age Superman, laying the groundwork for the latter. Jim Steranko, in his much acclaimed History of the Comics, has dismissed this decade in Superman's life as a period in which increasingly silly stories turned Superman into a laughing stock. Since Superman's writers didn't know how to handle his increased powers, the trend was to have him participate in domestic squabbles and other situations in which his powers could serve little useful purpose. Although it is true that stories such as these occurred, the period could just as easily be described as the science fictionalization of Superman. The level of conflict was escalated by the increasing use of aliens, including Kryptonian survivors. Luthor once again became a believable threat, thanks to the discovery of Kryptonite and his ability to synthesize it. A new aura of tragedy was added to the strip via an emphasis on Krypton's destruction and Superman's lost heritage. Apart from the continuing need to come up with new material, the main external cause of these changes was the departure of Siegel and Shuster from the strip in 1947. For the next decade, the two would devote most of their efforts to litigation concerning the ownership of the character. Curiously, although they were thwarted on every turn in their battle to establish ownership of Superman, they did manage to win a modest settlement concerning Superboy, who, the courts ruled, was a separate and distinct character and therefore an independent creation. Without the creative contributions of the two originators, the main force behind Superman became editor Mort Weisinger. Although Weisinger had worked with the character in the early '40s, he had been interrupted by the call of the military. Now returned from the service, he would devote the rest of his comics career to reshaping Siegel and Shuster's creation in his own image. In February of 1945, the first part of the wholesale revamping of the Superman legend occurred with the first appearance of Superboy (More Fun #101). In this first story, the idea that Kryptonians were not super on Krypton was first expressed. Superboy is said to have gotten his powers from Earth's lesser gravity. The notion that Superman grew up in a small town is first mentioned in this story. Curiously, the Kents are not given first names, and indeed play little role at all in these early adventures. 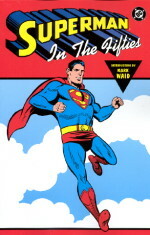 Inconsistencies in continuity began to get more noticeable at this time, for the Superboy character was not initially acknowledged in the Superman titles. Thus, in June of 1947, Clark Kent is portrayed as having gone to high school in Metropolis, not Smallville (Superman #46). In Superman #53, the full origin of Superman is told for the first time in a comic book (July 1948). No mention is made of Superboy, even though that feature had been running for three years. Kryptonians are portrayed as super powerful and no mention is made of Earth's lesser gravity as a contributor to Superman's powers. For the first time, Clark Kent's foster parents' names are given, as John and Mary Kent, the names currently ascribed to the parents of the Earth 2 Man of Steel. Beginning with this story, the planet Krypton, although mentioned hardly at all during the first decade, began to appear as a recurring motif. Scarcely six months would go by for the next decade without some kind of Krypton based story appearing in one or another of the Superman family of magazines. In [Superman #61] (Dec. 1949), Superman, for the first time (although possibly based on an earlier unpublished story from 1940), confronts a substance that can hurt him. Intrigued by this mysterious red glowing substance, Superman uses his super powers to discover its origin. By traveling faster than the speed of light, he is able to journey through the barriers of space and time and trace the mineral back to its point of origin. For the first time, Superman learns of his origins. "Now I understand why I'm different from Earthmen! I'm not really from Earth at all - I'm from another planet - the planet Jor-El called Krypton!" There is a price to pay for this newfound enlightenment, however, as Superman finds out two months later when Luthor learns to synthesize kryptonite, now and forever after colored green. In August 1950, Superman is confronted with his first Kryptonian menace, three super criminals who had been shot into orbit by his father, Jor-El, and thus survived the destruction of the planet. For the last time, the contention is made that everyone on Krypton has "extra strength and see-through vision." 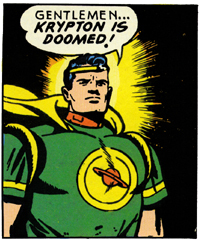 Initially, Superman's vulnerability to kryptonite is explained as being "due to the fact that the polarity of the electrical contact between the Man of Steel and his native soil has been reversed by the explosion of the planet and the effect of the formerly beneficial kryptonite has become negative." 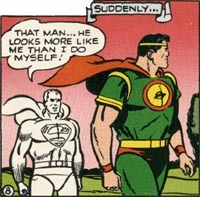 By 1951, the legend of Superman had been reconciled with that of Superboy. In Action #158, the origin is again retold, this time including Superboy. Jonathan and Martha Kent are now established as the Kent's true first names and Superman's powers are now firmly attributed to Earth's lesser gravity. However, in a LATER issue, Superman #73 (Nov-Dec 1951), Krypton is once again (perhaps for the last time) a planet of super-powered beings. This occurs in the second story, "The Mighty Mite". In Action #182 (July 1953) Superman states that Krypton's vastly greater atmospheric density led to the development of X-ray vision. He also states that "I could stay under water indefinitely on Earth, but [on Krypton] because of the greater exertion, I need more oxygen." Superman #113 (May 1957) also stresses the unique atmosphere of the planet, which apparently suppresses the natural abilities of the inhabitants. Through the '50s, Superman's knowledge of Krypton, and especially Jor-El's, is enhanced by a seemingly endless stream of remarkable discoveries. In Action #149, three thought projection disks, which give a detailed account of the courtship of Jor-El and Lara, are brought to Earth by a U.S. experimental rocket. In Superman #74, Luthor discovers a treasure trove of weapons which had been invented by Jor-El. In March 1954 Superman discovers Jor-El's last will and testament on the site where his rocket crash landed on Earth. (World's Finest #69). In May 1956, Metropolis is menaced by colossal war machines which turn out to have been built by Jor-El. In December 1956, Superman comes across Jor-El's journal and laboratory desk and some films floating far out in space. In May 1957, Superman finds a Kryptonian "mind tape" which describes an adventure Jor-El had on the planet Vergo. For more information about this era in Superman's history, see Superman: The Lost Decade by India Ink. On to the Silver Age Superman!